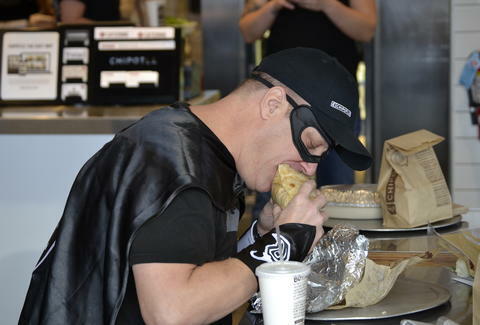 A Tiffin, Ohio resident named Bruce Wayne just set the new record for consecutive days eating Chipotle. He's eaten at least one entree per day for the last 426 days, mostly at one location. To put how strange this experience must have been in perspective, behold the ever-growing stream of near-identical pictures of burritos and bowls and receipts that is his Instagram. Incidentally, Bruce Wayne dresses up as Batman in his free time. Really. To commemorate this accomplishment, Chipotle bestowed a custom Chipotle cape and cufflinks upon Wayne and will reinvest the money he's spent over the course of the challenge toward a charity of his choosing. This amazing journey began on October 30, 2016 when Chipotle announced that it was opening a location in Tiffin, Ohio. Mr. Wayne began researching the chain's all-natural food options and found that they lined up with his diet. When he learned about the previous record of 425 days of Chipotle eating, he took up the challenge, as we all would in the situation. Inspiringly, Bruce Wayne has "has no immediate plans to stop." On the first of the year, he posted the photo of the burrito bowl above with the caption, "So happy to start my New Year off with a meal at my favorite place! ❤️ Wishing ALL of you the greatest joy and peace as we begin this New Year." James Chrisman is a News Writer at Thrillist who has never received a cape from anyone. Send news tips to news@thrillist.com and follow him on Twitter @james_chrisman2.